Office space prices from ₹7499 per month. Co-working Space and Hotel at the same time and located in a quiet area close to Mandrem Beach. Restaurants, shopping malls and hotels are close to the workspace as well as there is a bus stop just in front of the building. 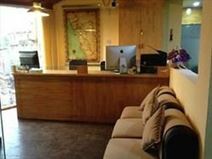 With friendly staff and the best services you can just start your work at one of the co-working seats and stay at the hotel at the same time if you would like to. Situated in the business district of Patto in Panaji, Goa, this business centre provides quality, fully equipped corporate space with good facilities. It is serviced by bus.